This projects starts early Sunday morning, August 21st, 2011 with a trip to the gas station. My good friend David is helping me to bring the truck home and will also be helping to do some custom welding to redo some of the previous suspension and steering modifications. The truck we're driving is called Behemoth, it's a 2004 Custom Kodiak Truck, custom build by David as he's a welder/fabricator. He started with a Kodiak Cab and grafted in the center section of a 1996 Chevy Van between the front and rear of cab portions to create a custom stretched truck cab. 15000 Ramsey Winch - Front. 3 Fuel Tanks, Two 60 Gallon Tanks and One 50 Gallon Tank. Rear Bed is 2007 Chevrolet Dually Pickup Bed - this is a Dump Bed and a Roll-back Bed. I met David when I detailed Behemoth and we've been friends ever since. David has added a full size camper in the last month so when he hauls Monster Trucks to the Triple Canopy Ranch for Mudfest events there's a place to hang out, eat dinner, etc. We drove from Stuart, Florida to West Palm Beach to meet the owner Tom and after backing the trailer into the driveway, Tom drove my new-to-me Chevy up onto the trailer. I would have done it myself but because I have an artificial leg I cannot drive, or at least I cannot safely drive a manual transmission. The wheels on my 1978 Chevy Truck are UGLY and I'm working on another set of aluminum slotted mags, kidney bean style. Anyone reading this that knows where a set of 8-lug, 16.5 by 12" wide get a hold of me. Here's the rear-end, it needs cleaning. The front and rear axles are supposed to be out of a 1986 Military Suburban. Rear drum brakes and missing cable for the emergency brake, need to get this and any of the other missing hardware. I own a boat and it's nice to have an emergency brake for emergencies but also for launching boats at the boat launch. Turbo 350 mated to a NP208 Transfercase that's going in after it's cleaned up and gets some new seals, filter, fluids etc. Looks like a homemade steering arm, I'll let David either warm it over or we'll replace it. I did a tune-up on the engine and now it starts and idles pretty good. Saturday morning I'm going to do a compression check and also pull the valve covers off and watch the valve train for any obvious problems if there's a discrepancy in the compression between cylinders. Both of those trucks are gorgeous. The 78 looks like a great starting point. If you were closer to me id see if you were interested in selling me that 4 speed! Haha. Good luck with the project. Alright Mike, that does it!!! You shine cars like no other, and now you are going to have my dream truck. Why don't you just run me over with Behemoth...LOL. Cant wait to see where you take this. I assume this is the replacement for the Blazer? very nice start. 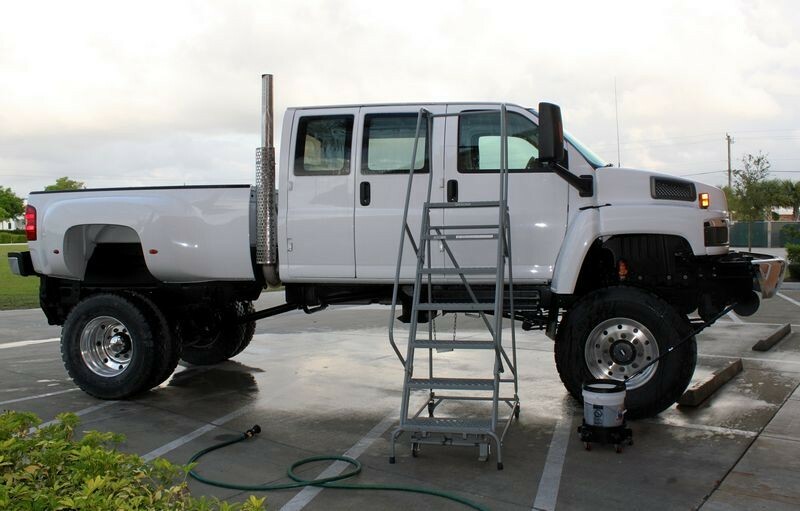 I love lifted trucks personally, so I am all for this project. #1: The easiest and most obvious solution to any problem is 99% of the time correct. #2: There is no such thing as impossible, it just takes longer. I assume this is the replacement for the Blazer? Actually... once this 3/4 ton is on the road it will make my Jimmy my "economical driver", that is the Jimmy will get better gas mileage than the 3/4 ton truck so I figure I better keep it for gas savings. The Jimmy is also my "Airport Car" as it fits under the concrete ceiling for short term parking at the West Palm Beach Airport. It just barely fits. The top of the windshield frame is about an inch away from the concrete ceiling beams in the airport parking structure. It's kind of freaky driving into the structure as you hear this wind noise as you pass by each concrete beam as the truck is a full convertible. So at this time I'm going to keep the Jimmy. I'm actually thinking about pulling all the running gear out of the Jimmy since it's "new" and proven and swap in the other running gear and engine not being used for the 3/4 ton. The engine is the Jimmy is a Mark VI Roller Cam 454 that's only 2 years old with a 700R4 built by Dana Sniff. Did a compression check on the engine last night, compression on all 8 cylinders averaged 145 to 150 pounds. After the compression check I removed the valve covers and watched the valve trains operate as the motor was turning over and valve opening and closing all looked normal, no sigh of a flat cam lobe, broken rockers or bent pushrods etc. Before I start taking apart the drivetrain on the 3/4 ton I'm going to go through the brakes and get them all rebuilt, this will start this Saturday. i like those valve covers. those custom, or you buy them ? Mike, great write up on a cool project. As far as the axle go, what gears do they have? As far as I know chevy didn't make any Military CUCV Suburbans. Lots of trucks with 4.56 gears are assumed to have Military axles (Military pick ups had 4.56's, the blazers had 3.08's) to put the 1 ton rear axle under your truck means they had to change the spring hangers. If you measure the spring perches on the axle we can figure out if it's a 1 ton or 3/4 ton unit. Just trying to make sure you get the correct brake parts. Great project, looking forward to the build.